Green trees, neatly maintained grass and beautiful Victorian styled buildings will create a relaxing, peaceful atmosphere in Cathay’s Park, the world class civic centre of the city. You can spend an hour in meditation, dwelling on the experiences you’ve had in Cardiff or you can visit a few of the interesting and important buildings located here, like the Cardiff University and the National Museum. Most of the land upon which Cathay’s Park stands was acquired by the Bute family, through investments and inheritance. In 1898, the local council bought 59 acres of land in order to build a new town hall and since then, the land was developed very carefully, with the intention of turning the area into a cultural, educational and civic centre. Today, there are around 16 important buildings at the site, including the City Hall, the Crown Court and the Crown Building. Today, you can head to the park and grab yourself a much needed break and take a walk through this park. From spring till autumn, the flower beds bloom with life and benches pepper the park grounds. There are three main garden areas, Alexandra Gardens, Gorsedd Gardens and Friary Gardens, each with their own distinctive characteristics. All three are conservation areas and are full strong trees, lush grass and pretty flowers. Ideal for picnicking, these gardens are a popular lunch-break destination. Visit the National Museum and Gallery and be amazed at their extensive and impressive collections of art and antiquities. There’s an incredible wealth of talent displayed by local artists as well as some masterpieces by internationally renowned names. Several significant war memorials in the area lend a contemplative tone to the atmosphere, such as the Welsh National War Memorial. 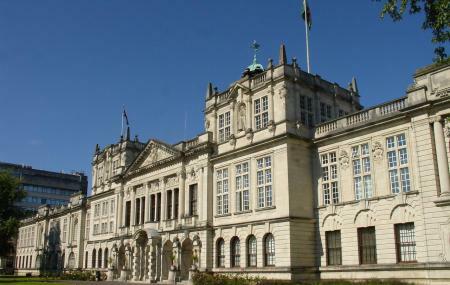 You can visit the administrative centres of Wales here and get a taste of the local politics. Other Hours: Each of the buildings in Cathay’s park have their own opening and closing timings. Everything will be open by 1000am though. Tips and Warnings: The main Students Union building, located at the heart of the campus on Park Place, is one of the biggest and most active in Britain. Events, clubs and information services are provided, and on-site facilities include a cafe, general shop, bookshop, student letting agency, large games room, nightclub and pub. On street parking: parking charges apply (metered). All the parks are easy to access and wheelchair friendly. How popular is Cathay's Park? People normally club together Delta Force Paintball Cardiff and The Cardiff Story while planning their visit to Cathay's Park.